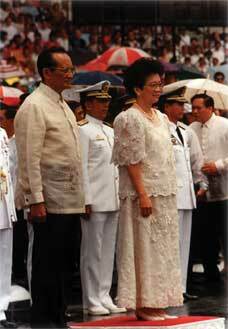 The stage was set for a contest between Ninoy’s widow and his political nemesis. The next presidential polls were not due until 1987, but pressed by the Unites States and the country’s international creditors to prove his mandate, Marcos called a snap presidential election for 1986. After a day of fasting and prayer, Cory declared her candidacy over the objections of many in her family. Dressed in her trademark yellow, she drew huge crowds wherever she went. 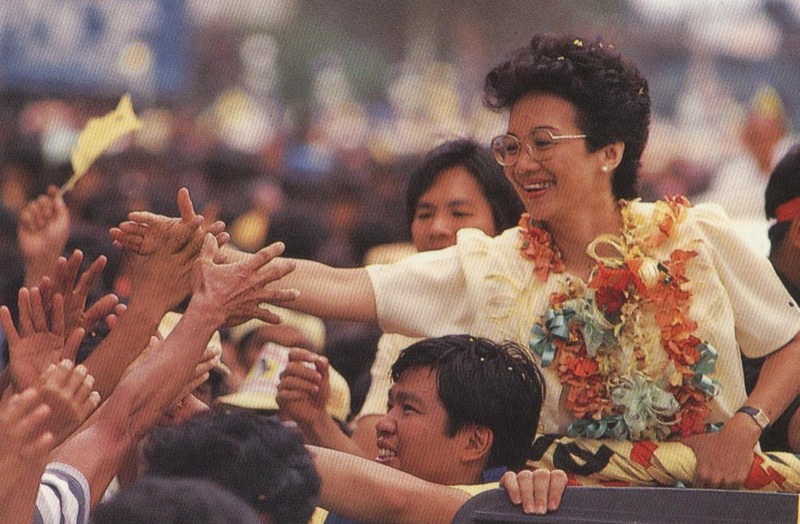 (Ninoy’s welcomers had decorated trees and lampposts with yellow ribbons in 1983, in reference to the song Tie a Yellow Ribbon ‘Round the Old Oak Tree.) Marcos derided Cory as “just a woman” whose place was in the bedroom. She called him a coward for threatening to take her out with a single bullet and promised him no more than a single ballot in return. Cory cast the election as a morality play in which Filipinos could finally bring Marcos to account for his evil deeds, not least the assassination of her husband. The election was held on February 7, 1986. As expected, Marcos’s henchmen did everything to ensure victory, from bribery to coercion, to stealing ballot boxes, to manipulating the counting. But a third force had entered the equation. In the past, the middle class, the business community, and the Catholic Church had shied from politics, but Ninoy’s murder and his widow’s candidacy had galvanized them. One of the most compelling images of the 1986 election was that of nuns, students, and professionals forming human chains to guard the ballot. Another was the walkout of computer programmers, many of them women, from the control center of the national canvassing office. The numbers they were inputting into their machines, which showed that Cory was leading, were not being reflected in the tabulation boards, which were giving Marcos the edge. But the Marcos-controlled legislature proclaimed their patron winner, with 10,807,197 votes to Cory’s 9,291,716 votes. Cory rejected the result and called for a nonviolent protest movement. Then, reformist elements of the armed forces made their move. They had been plotting a coup against Marcos, but the snap presidential election temporarily derailed their plans. The project was resumed after Marcos blatantly stole the 1986 polls, but the government discovered the plot. Threatened with arrest, defense minister Juan Ponce Enrile and armed forces vice chief of staff Fidel Ramos holed up in Camp Crame, along Manila’s main thoroughfare, Epifanio de los Santos Avenue (EDSA). Jaime Cardinal Sin appealed for civilian support over Radio Veritas. In a repear of Ninoy’s funeral and Cory’s campaign rallies, Filipinos came in the thousands to form a human shield against Marcos’s minions. It was the birth of People Power, a nonviolent way for ordinary citizens to reclaim their freedom and bring about a peaceful transfer of power. Television viewers across the world marveled as hundreds of thousands of praying Filipinos, armed only with rosaries and flowers, repulsed tanks and armored vehicles. 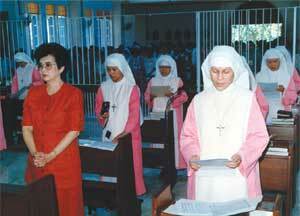 Cory took her oath of office as the country’s eleventh president at 11:00 a.m. on February 25, 1986, at Club Filipino. One hour later, Marcos held his own oath taking within the forbidding walls of the presidential palace. All the while, however, he was negotiating with his longtime ally, the United States, for sanctuary for himself and his family. Senator Paul Laxalt, US President Ronald Reagan’s special emissary, had told him: “I think you should cut and cut cleanly.” That night, American helicopters took the Marcos family and their associates to Clark Air Base, north of Manila, where they later took a plane to exile in Hawaii. Marcos died there in 1989. The issue of who would write a new constitution was a contentious one. If she called elections for a constitutional convention, Cory courted the danger of having Marcos loyalists control the assembly because they were the ones with money. Her vice-president, Salvador Laurel, advised her to name a dozen or so eminent Filipinos, perhaps retired Supreme Court justices. But other voices urged holding polls to show the people she was no dictator. In the end, she decided to form a fifty-member Constitutional Commission drawn from all sectors of society, including the opposition. “We tried to choose from the women’s sector, from farmers’ groups, from business, from academe,” Cory recalls. “We tried to make it as representative as possible.” And she says she never interfered in the deliberations, including the election of the body’s officers. The new constitution, perhaps the world’s most lengthy and detailed, was completed in record time and approved overwhelmingly by the people in 1987. Elections for the newly restored Congress followed. Voters gave Cory and her allies another handsome victory, handing them twenty-two of the twenty-four available Senate seats and a big majority in the House of Representatives. Cory was still clearly beloved, but she faced extraordinary challenges. She had retained the rightist Enrile as defense chief and named the pro-American Ramos as head of the armed forces. At the same time, Cory appointed left-leaning human rights activists who were Ninoy’s allies to other key cabinet posts. Even an experienced leader would have been hard-pressed to reconcile the personal and ideological tensions between the contending camps. Both men harbored political ambitions. Marcos had seen Enrile as a threat to his wife Imelda’s own presidential bid and so sidelined him in the latter part of his rule. The defense minister had staged his own car ambush in 1972 to give Marcos an excuse to declare martial law. He was the patron of the military officers who formed RAM (Reform the Armed Forces Movement), the planner of the 1986 coup attempt that precipitated the People Power revolt. As for Laurel, he had long been positioning himself as the opposition standard-bearer. His father, Jose P. Laurel, was president during the Japanese occupation, a member of the same regime that Ninoy’s father served as House Speaker. Ninoy and Doy, as Salvador Laurel was popularly known, were childhood friends, but Doy was persuaded to join Marcos’s Kilusan ng Bagong Lipunan (KBL) party in 1978, although he later broke away. Enrile did not go gracefully into the night. He called his own version of People Power, but his supporters never reached the numbers at EDSA in 1986 and dwindled sadly away. He campaigned against the ratification of the new constitution and was rebuffed by the electorate. Still, he squeaked into the Senate in the 1987 elections made possible by the charter he opposed, one of only two oppositionists elected (the other was action star Joseph Estrada, who became president in 1998). Cory felt Enrile was not ready to give her respect and friendship. She remembers announcing to her cabinet her decision to advance her state visit to the United States. Have you been promised anything? Enrile asked pointedly, adding that Marcos never went on a state visit unless he knew exactly what he would get. “He was really so haughty,” says Cory. She went ahead with the trip and got a standing ovation from a joint session of the US Congress, plus a US$200-million grant for the Philippines. The RAM boys, too, would not be placated. Gregorio “Gringo” Honasan, a young charismatic colonel who emerged as one of the heroes of EDSA in 1986, led some twelve hundred soldiers in a failed attempt to take over the government in November 1986, in a plot they called “God Save the Queen.” In August 1987, he and his followers stormed the headquarters of the armed forces and the presidential palace, but were repulsed by troops whom Ramos, now defense secretary, rallied around the presidency and the constitution. Pro-Marcos forces previously tried to wrest power, but the attempt by a section of Cory’s own military was the most serious try. Honasan fled when the coup collapsed but was captured four months later. Held in a prison ship, he managed to escape with some of his guards in 1988—to resurface in 1989 for another takeover try. That seventh and last attempt was put down with some help from the United States. Enrile was implicated in the RAM coup d’etat plots, but was never indicted. Laurel chose to break away from Cory after the “God Save the Queen” attempt. After visiting military camps to ascertain sentiment toward government policies, he expressed support for the rebellious soldiers and resigned his post as foreign minister. Ever the politician, he may have been positioning himself as Cory’s successor if the military were to force her to resign. But the queen had no intention of stepping down, even as the self-appointed knights of the republic insisted on “saving” her. With everything that she had gone through, Cory had become fearless. She refused to leave the center of power at the height of the coups, even when her only son Benigno III was shot and wounded in the August 1987 coup attempt. Cory had pledged to restore democracy, and that meant a peaceful transfer of power to a duly elected successor when her single six-year term ended. Historians are beginning to assess the Aquino presidency. 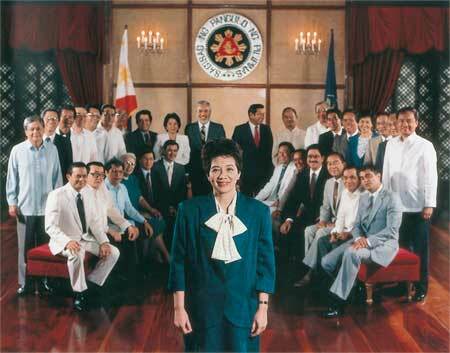 A key thesis is that the military coup attempts forced Cory to move to the right from her left-of-center position in 1986. “I will admit that I gave more time to the military because they were the biggest threat not only to me but to our democracy,” she says, although she denies she got soft on cracking down on human rights abuses. Still, Cory continued peace negotiations with communist insurgents and Muslim rebels in the south, convinced that force should be the last resort. Jose Ma. Sison, the chair of the Communist Party she ordered released, had fled to the Netherlands and continued to direct the armed struggle from there. “My line insofar as the Communists and Muslim rebels were concerned was that we should follow the Constitution, that we cannot give more privileges or perks simply because you were against the dictator,” says Cory. But there are limits to government by consultation, especially one that has yet to find its feet after decades of authoritarian rule. In the wake of the God Save the Queen plot, Cory started to take unilateral decisions, turning her presidency into a Committee of One to combat perceptions of drift in governance. “It was a step forward in political stability, but a step backward in political maturity,” she admits. On occasion, Cory also felt the freewheeling media needed restraining. She put her foot down on government-run television airing an interview with the fugitive Honasan, but did not intervene when a private station aired the scoop. “I was saying, ‘Look, I’m not a masochist and I’m not about to allow a government-run television station to air the side of the enemy.” Pardoned by President Ramos, Honasan won a seat in the Senate in 1995. “We always have a tendency to forgive or, at the very least, to forget,” sighs Cory. That was Cory the financial manager talking. Her critics thought she was listening too much to her financial advisers, but in fact the president knew what she was about. “In time, every president understands that you don’t deal with a problem by itself,” she says. “A problem cannot be dealt with in isolation of other requirements of government.” A president must also learn how to bow to the inevitable, as Cory had to do with the negotiations on the renewal of the US lease on its military bases in the Philippines. After keeping her options open, she signaled her support for the ratification of a 1991 treaty allowing the Americans continued access to the installation for ten years, with the option to renew for another ten. The Senate voted 12-11 against the agreement and the Americans were out of the country by 1992. For Cory, perhaps the hardest lesson was that personal ties must sometimes be sacrificed for the greater good. After the God Save the Queen coup attempt, the calls for the resignation of her left-leaning executive secretary, Ninoy lawyer Joker Arroyo, became more insistent. Cory considered finance minister Jaime Ongpin a personal friend, but the Left regarded the businessman’s appointment to the cabinet as too eager to appease Washington and the country’s international creditors. In both cases, Cory complied.